Reguirement of documents of I/c Lecturers for regularization in various disciplines elevated w.e.f 01-01-2018 to till date..
Drawal of pay of the Surplus, Court Cases, Medical grounds (Life consuming) and Rationalization- regarding Masters. Orientation Programme For Students and Parents. Grant of permission/recognition/extension in the period of recognition in favour of Private Institutions. Approved list of books for the year 2018-19. Provisional permission/registration of Private Tuition/Coaching Centres of Jammu Division. Drawal of pay of the surplus, Academic requirement , Court cases, Medical grounds (life consuming) and Rationalization regarding Masters. All Employees of School Education Department, Jammu Division. In-Situ Promotion of Masters/Librarian/Senior Assistant. . Provisional registration of Tuition Coaching Centre of Jammu Division. Divisional Level Committee against Sexual Harassment of Women at Work Places. Provisional permission, registration of Private Tuition & Coaching of Jammu Division. Drawal of pay of the Surplus, Academic requirment, Court cases, Medical grounds (Life consuming) and Rationalization-regarding Masters. Public Notice for inviting applications for students belonging to Orphan, Destitudes and families of BPL for their admission in coaching centres. Nomination of Public Information Officer (PIO) under J&K Right to Information Act, 2009. In-situ Promotion of Masters, Sr. Asstt. & Class IV. 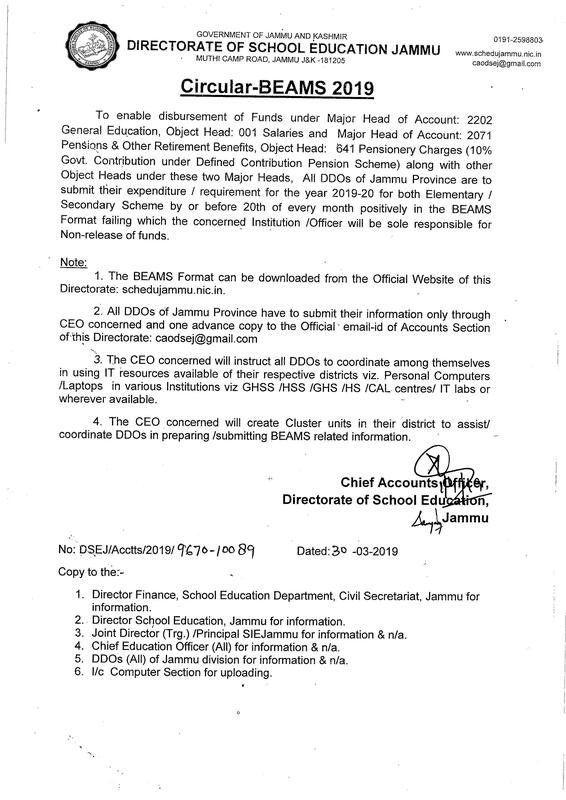 Provisional registration of Tuition/Coaching Centres of Jammu Division..
Grant of Post Facto permission in favour of Principals/Lecturers/Masters and others. Grant of permission/recognition/retention in the period of recognition in favour of Private Schools. Circular regarding Examinatoin Stress Management. Provisional permission registration of Private Tuition Coaching centres of Jammu Divisoin. Provisional Registration of Tuition/Coaching Centres of Jammu Division (New). Provisional registration of Tuition/Coaching centres of Jammu Division. Drawal of pay of the Surplus, Academic requirement, Court cases Medical grounds (Life consuming) and Rationalization Masters. Deficiencies in the Post facto permission cases of Masters.. Confirmation of Result for the Session 2018-19 Winter-Summer Zone. Drawal of Pay of the Surplus, Academic requirment basis, Court cases, Medical grounds (Life Consuming) and Rationalized Masters..
Regularisation of I/c CEOs as CEOs & equivanlent furnishing of documents thereof. Checking Private Schools, Selling Uniforms/ Books etc in the school premises. Grant of permission/ recognition extension in the period of recognition in favour of Private Institutions. Enhancement in Working Hours in Government offices of the State. Divisional Level Committee for hearing the complaints pertaining to Sexual Harassment of Women at Work places. Service particulars of Regularized Lecturers and seniority thereof for Jammu Division. Recoginition Permission in favour of New Era Public School, Doda. Recognition Permisson in favour of Pvt Schools of Jammu Division (11 Cases). Recognition Permisson in favour of Pvt Schools of Jammu Division. Districtwise/ Subject-wise Service Particulars of Regularized Lecturers. Constitution of Monitoring Teams on implementaton of cancellation of attachments and deployments on academic rationalization basis. Implementation of Mid Day Meal Scheme. Deficiencies in the Post facto permission cases of Masters. Publicising ICAI Commerce Wizard-2018. A talent search test among school students. Post-facto permission case of Masters for making entry in the service record. Updated seniority list of Masters for placement as I/C Headmasters or equivalent as it stood on 21-6-2018. Drawal of pay of the surplus, deployed, Court cases, Medical grounds (Life Consuming) and Rationalized Lecturers. Drawal of pay of the surplus, deployed, court cases, Medical grounds ( Life Consuming) and rationalized Masters. Recognition/Permisssion in favour of Al-Hilal Educational Institute, Kishtwar. Verification of tentative seniority list of Masters. Recognition Permission in favour of New Era Model School Basohli. Recognition/ permission in favour of Pvt Schools of Jammu Divsion. Post facto permission cases of Masters for making entry in the service record. Recognition /Permission in favour of Mount Litera Zee School Zone Vijaypur. Streamlining of functioning of Private Tuition Centres. 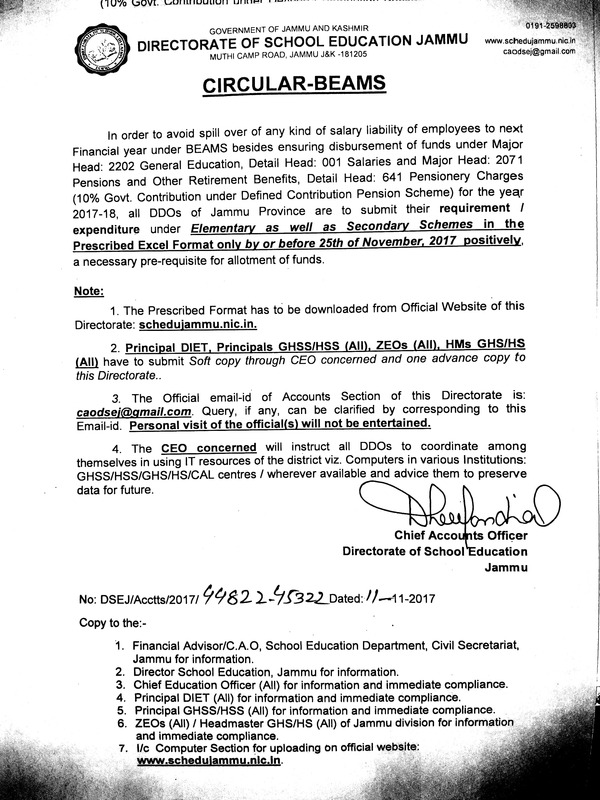 Circular on: Drawal & Disbursement of Salary. Rejuvenation Cadre of Master Trainers Coaches to improve Academic Monitoring. Deficiencies in the Post facto permission cases of Teachers/ Masters. Recognition/Permission in favour of Pvt Schools of Jammu Division. Final/Updated list of PG Masters/Teachers in the discipline of Chemistry. Compassionate appointment cases under SRO 43. Post Facto Permission case of Masters Lecturers for making entry in the Service records. Recogintion Permission in favour of Pvt. Schools of Jammu Division. Approved Supplementary list of Books for the year 2017-18. Approved list of Books of Local Authors for the year 2017-18. Recogination Permission in favour of Sunray's Children's Institute, Gudda Street Ram Nagar Chowk (Udhampur). Recognition Permission in favour of Yuva Shakti Model Academy, Galwadey Chak (Marh). IN SITU PROMOTION OF MASTERS. Recognition, permission case of Diamond Public School, Sangldaan. Recognition, Permission in favour of Scientia International School, Ban Talab (Zone Bhalwal). Placemnt of Ic Head Assitant as Ic Section officer and adjustment thereof. Deficiencies in the Post facto permission cases of Teachers, Masters, Principals. Recognition Permission in favour of Pvt Schools of Jammu Division. Approved list of Books for the year 2017-18. Post-Facto Permission case of Masters for making entry in the Service records. Final List of Sr. Lecturers. Post facto permision case of Masters for making entry in the service records. Allotment of funds under object Detailed Head 670 Leave Encashment and 071 Medical Re-imbursement (CEOs and DIETs). Deficiencies in the post facto permission cases of Teachers/Masters/Lecturers. Nomination OF Public Information officer (PIO) under J&K Right to Information Act, 2009 in respet of Directorate of School Education Jammu. Release of funds under Salary and NPS. Placement of IC Head Assistants as In charge Section Officers on Stop Gap Arrangement in their own pay and Grade. Placement of Junior Assistant (s) as IC Sr. Assistant (s) on Stop Gap Arrangement in their own pay and Grade. Placement of Junior Librarian (s) as IC Librarian (s) on Stop-Gap Arrangement in their own pay and Grade. Placement of Senior Assistants as In-charge Head Assistant on Stop Gap Arrangement in their own pay and Grade. Deficiencies in the Post-facto permission cases of Teachers/Masters. Recognition permission in favour of Satyaketu Vidyalays, Kotli Mian Fateh R.S. Pura. Compassionate appointment case of Mr. Amandeep Sharma S/o Late Sh. Joginder Paul District Jammu under SRO 43. Recognition Permission in favour of Dr. Ambedkar Memorial Convent School Badhole (Ghordi). Allotment under object Detailed Head 008 Electricity for 2017-18 (CEOs). Allotment under object Detailed Head 008 Electricity for 2017-18 (DIETs). Compassionate appointment case of Mr. Raghav Pandoh. Compassionate appointment of Ms. Himani Goswami & Mr. Avinash Sharma District Jammu. 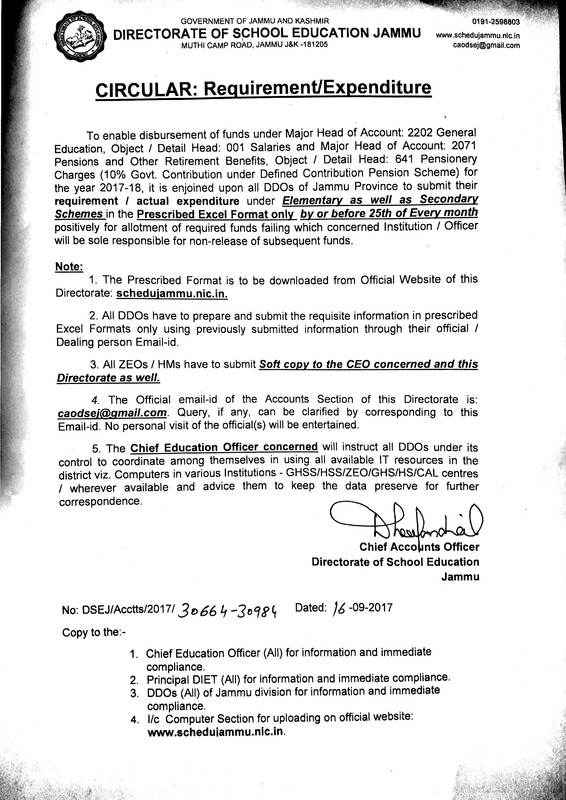 Charging of Admission Fee-Annual Charges by Private Educational Institutions of J&K.. Recognition, Permission case of Private Schools. Uploading of Employee details on the CPIS Portal by DDOs in a time bound manner. Deficiencies in the Post facto permission cases of Teachers Masters Lecturer. Admission of in-service teachers in D.E.Ed training Programme for session 2017-18 in DIETs. (1) Requirement Expenditure Overall Cadre. (2) Requirement Expenditure Sanctioned Posts. Deficiencies in the Post facto permission cases of Teachers, Masters & Non Teaching staff. Guidelines for safe internet usage and launch of awareness drive against internet game "Blue Whale Challenge"
Recognition/Permission in favour of Pvt Schools of Jammu Division..
Allotment Salary HSS dt 12-08-2017. Allotment NPS HSS dt 12-08-2017. Allotment Salary Overall Cadre HSS dt 12-08-2017. Deficiencies in the post-facto permission cases of LECTURERS/ MASTERS/ TEACHERS/ NON-TEACHING. Awareness about Environmental Education and launch of plantation drive to save environment. Compassionate appointment case of Mr. Brighu under SRO 43. Compassionate appointment case of Miss Tripta Devi D/o Late Sh. Parkash Singh Ex. Peon Govt. MS Panchari. Post Facto Permission cases of Teacher/ Master/ Lecturer & Non-teaching for making entry in the service records. Permission to appear in various examination of the School Education Department. Recognition Permission in favour of Jorawar Publc School, W.No. 17 Partap Nagar (Kathua). Recognition Permission in favour of National Academy Dhargloon, Balakote Poonch. Recognition Permission in favour of MMS Indian public School Simbal Camp (Miran Sahib). Compassionate appointment case of Mr. Soam Raj (Brother of Salochana Devi, Teacher GPS Kakdera Zone Basholi). Post facto permission case of Sh. Satya Dev Singh HOD DIET DODA. Post Facto permission case of Sh. Sanjay Kumar Teacher GPS Kotli Manyotrian Distt Reasi. Post facto permission case of Sh. Anil Kumar Teacher MS Pipple Zone Ghordi Udhampur for MA English. Post facto permission case of Miss Bandana Sharma Do Sh. Uttam Chand HS Chiryai for M.Sc (Evs) regular basis for H.N.B Garhwal Uttarkhand. Deficiencies in the post facto permission cases of Teachers Masters Lecturer Non Teaching. Post Facto Permission case of Teacher Master Lecturer Non teaching for making entry in the service records. Drawal of pay of the Surplus, Deployed, Court Cases and Medical grounds (Life Consuming) and Rationalized Masters. Quotations for supply of stationery & Misc items. 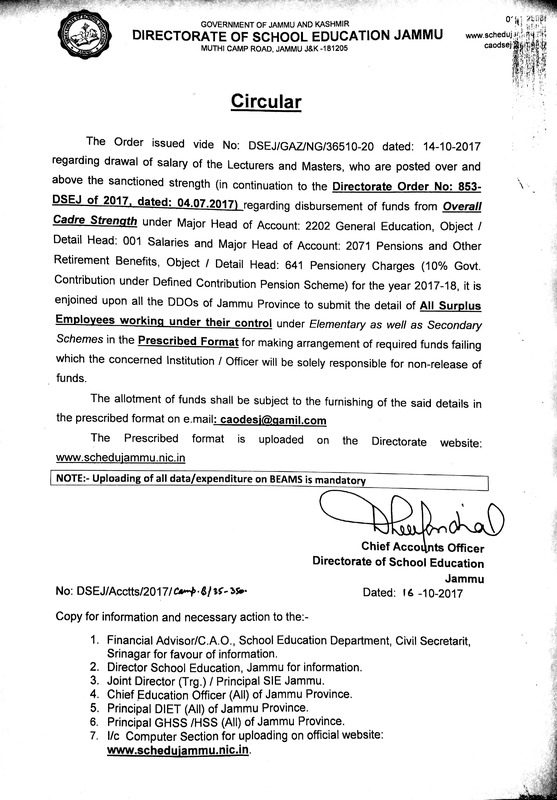 Final Notice to Master adjusted vide order No:137-DSEJ of 2017 dated: 28-02-2017.
and Junior Librarian for inviting objections for fixing of final Seniority. Compassionate appointment case of Miss. Sumedha Sharma Do Late Sh. Chander Mohan Ex. Teacher Govt. MS Sandoo. In-situ Promotion of Masters ORDER NO. 705 DATED 08-05-2017. Updated seniority list of PG Masters Teachers in the discipline of English. Appointment of Lecturer 10+2 in Urdu. Appointment of Lecturer 10+2 in english. Deficiencies in the Post facto permission cases. Change in timing for schools falling in summer zone of Jammu Division.